My love of science began when I was in middle school, and spent many summer afternoons reading books full of science essays (along with a fair number of science fiction novels!) at the public library. My father had a degree in chemistry, and loaned me some of his old textbooks to read, giving me a solid background in college chemistry before I had even reached high school. I took some courses early, and had finished the first two years a chemistry degree before I even graduated. With the extra time available, I decided to add a physics major. Despite being accepted in chemistry at prestigious graduate programs like Stanford and the University of Chicago, I decided I wanted to continue in physics instead, since I enjoyed the course work so much. The University of Colorado's campus at Boulder offered me a chance to do research that substantially overlapped with my chemistry interests in theoretical molecular spectroscopy, while still getting a doctoral degree in physics. I regard this combination as the best of both worlds, -- getting to do research in down-to-earth topics like the behaviour of light interacting with molecules, while being immersed in rigorous study of the fundamental physical laws of the universe. Since graduation, I've focused on becoming the best teacher possible and on improving my understanding of the best ways to clearly communicate topics in undergraduate physics. 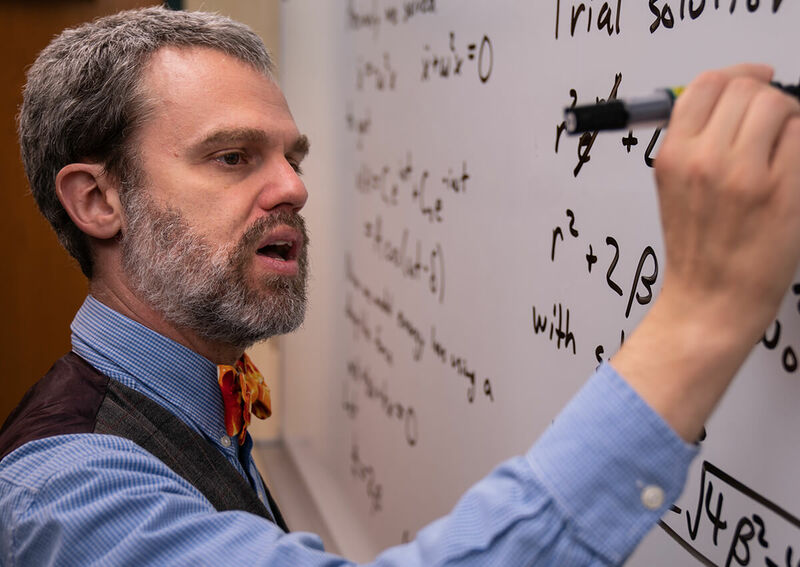 With a major in engineering physics, LeTourneau students will be well-equipped to transition into a variety of more applied fields, but you'll also be prepared to tackle graduate study in fundamental physics as well. Last Lecture Series, invited talk, November 2009. Professor of the Month, GVSU Interfraternity Council, April 2009. "Someone Who Really Makes A Difference At GVSU" nominee, 2008 & 2009. Mathematics Departmental Award for Outstanding Graduating Senior, Calvin College, 1997. INFORMS Award, Mathematical Contest in Modeling, 1997. John A. Bolt Memorial Scholarship, Chemistry, Calvin College, 1996-1997. John and Lillian Van Oosten Scholarship, Physics, Calvin College, 1995-1996. "Experimental verification of minima in excited long-range Rydberg states of Rb2"
Phys. Rev. Lett. 97, 233002 (2006). "Alignment enhancement by the combination of a short and a long laser pulse"
Phys. Rev. A 73, 033405 (2006). "Nonadiabatic Alignment by Intense Pulses. Concepts, Theory, and Directions"
Ad. At. Mol. Opt. Phys. 52, 289 (2005). "Nonadiabatic laser-induced alignment of iodobenzene molecules"
Phys. Rev. A 70, 063410 (2004). "Nonadiabatic alignment of asymmetric top molecules: Rotational revivals"
J. Chem. Phys. 121, 783-791 (2004). "Competition among molecular fragmentation channels described with Siegert channel pseudostates,"
Phys. Rev. Lett. 89, 263003 (2002). "Shape-resonance-induced long-range molecular Rydberg states,"
J Phys. B 35, L199-L206 (2002). "Quantum and semiclassical analysis of long-range Rydberg molecules,"
Phys. Rev. A 64, 042508 (2001). "Calculation of a preconvolved HD photoionization spectrum using the rovibrational frame transformation,"
Phys. Essays 13, 265-271 (2000). "Numerical studies of one-photon near-threshold photodetachment,"
Laser Phys. 9, 190-200 (1999). "A computational study of M-M multiple bonding in Ph2MMPh2n-, where M=B or Al, and n=0, 1, or 2,"
Main Group Met. Chem. 21, 219-224 (1998). "Collapsing dressed states and photoelectron spectra in near-threshold photodetachment,"
Laser Phys. 7, 892-896 (1997). "Pursuit-evasion game in the late Cretaceous,"
The UMAP Journal, 18, 213, (1997). Division of AMO Physics, 2001-present. American Association of Physics Teachers, 2009. Council on Undergraduate Research, 2009-present. Journal of Physics B, 2002-present. Journal of Physics A, 2006-present. Journal of Physics: Condensed Matter, 2006-present. Journal of Chemical Physics, 2006.